Screenwriter Robert Orci while promoting Cowboys & Aliens at this weekend's WonderCon in San Francisco dropped some info on the upcoming Star Trek sequel which he's developing alongside writing partner Alex Kurtzman. The writer revealed he believes that production will begin this fall and admitted that specific fan reactions to the original film have directly influenced the sequel's direction. Hit the jump for the details. "Everyone said [Kirk] is too young to become Captain," he explains, "So maybe in the next movie, somebody goes, 'Man, you sure became Captain young and fast.' You start to incorporate people's opinions... If it's organic to the story and you find someone who doesn't think too highly of Kirk because he maybe skipped a few steps, that's maybe a fun thing to consider. That comes from a fan reaction and maybe gives you a story point." On the fan-base's reaction to the 2009 original. "[Fans] wanted more character time with everybody," he adds, "and, because that was an origin story for 'Star Trek,' everyone had to come in at a certain point. Now everyone is going to be there from the beginning, so they're going to get that. Everyone sure hated engineering. They thought it looked like a brewery, which it was. I'll pass that on to J.J. [Abrams] and see what he says." While the first draft of the script is complete, Orci's job is far from over and plans to be working on the sequel for some time to come. "We'll be working and tweaking that story through shooting," he says, "This time we don't have a strike, so we'll actually be able to change things on the set. On the last movie, we handed in the script and that was it. You couldn't change a word. This one feels like we've got all the time in the world." On the direction of the Sequel. "You start to learn what works and what doesn’t work from before, but every time you go out there, it’s the same blank page, and it’s the same horrible process. But in all of the genre stuff we do, we always say, what is the little theme that would be an independent movie if you didn’t have robots or space ships or Klingons? And if you have that story, then maybe you’re on the right track. In Star Trek, it’s a brotherhood of opposites that have to come together. In Transformers, it’s a kid growing up to adulthood. In this, we wanted to make sure we found the same kind of character starting place that allows everything else to happen around it." On the themes of the Sequel. "I think we get to be a little bit more daring with the theme. The first one had to be an origin story – or we felt it had to be an origin story – it was kind of ‘Star Trek Zero’ – how did it all start? So to do that organically, you had to get each character in his or her place. Now, they’re all together from the beginning, and so now they’re all going to face, I think, a theme that is different and potentially more challenging than just: they met and they’re kind of facing this force of nature in Nero. So the theme of their family is going to be something great to explore that you don’t get in the first movie." 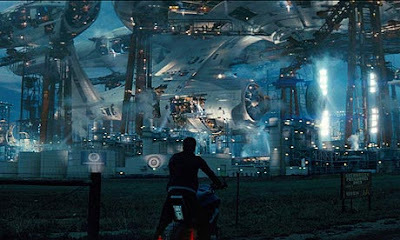 Star Trek 2 is scheduled to hit theaters June 29th 2012. I'm reading: SCREENWRITER ROBERT ORCI DROPS DETAILS ON [STAR TREK 2]Tweet this!